Insider knows Ireland's population is to rise by one million over the next 20 years. This will see Galway's population grow to beyond 100,000 between now and 2020. These predictions come from the North Western Regional Authority in its submission to the National Planning Framework – Ireland 2040, and these projections might be true, if planning applications lodged in recent months come to anything. If the Vacant Site Levy due to take effect from 2019 has influence, large sites at the heart of the city will soon see cranes erected, as Galway once again becomes a building site. Eyre Square East, the site assembled by the Odeon Consortium, then acquired from Nama by the Comer brothers, also the derelict Corrib Great Southern, together with CIEs' Ceannt Station regeneration lands, and the Bonham Quay site at Galway Harbour, may together see the historic medieval centre of Galway doubled in size, with a huge increase in numbers of people arriving into the city for work on a daily basis. Most by car of course. However Insider believes such grand schemes do not include enough residential housing development, just a few high priced executive rental apartments perhaps. Growth is to be made up of more profitable central business districts offices, yet more shopping centres, and a few new hotels. Galway's central housing areas will however continue to see a decrease in the number of families actually living within traditional city communities. Recent census statistics show us that in the period from 2011 to 2016, six 1km grids in the city centre saw their populations decrease by a total 1,085. The most significant declines took place in grids containing Bohermore and Ceannt Station, with decreases of 448 and 333 respectively. In effect, our city is being hollowed out with its residential content being pushed out to the periphery. The long talked about Ardaun village, which has taken 20 years to plan, is only now at local area plan public discussion stage. Insider worries how all these new office, hotel, shop, and factory workers are going to arrive at their workplace each morning when our creaking public transport system is bogged down in the same traffic most commuters are currently stuck in. Increasing the number of quality bus corridors is proving difficult. While building a city-wide Light Rail Network for electric trams - the only solution Insider believes can be effective - is being ignored by transport authorities. Where does this leave Galway today? In short, the answer is shown in the example given in an IDA case study (May 2014 ), which included Ballybrit, Parkmore, and Galway Technology Parks, and includes companies such as Boston Scientific, Medtronic, SAP and Merit Medical, which shows that of the 16,701 rural dwellers who commute to work within the gateway of Galway, one quarter (25.6 per cent or 4,285 ) commute to work in the IDA case study area. These numbers have increased to more than 20,000. Past failures by the county council planners and IDA executives to even notice the growth in of car dependent workers arriving, and to plan accordingly, should see heads roll - but of course it will not. 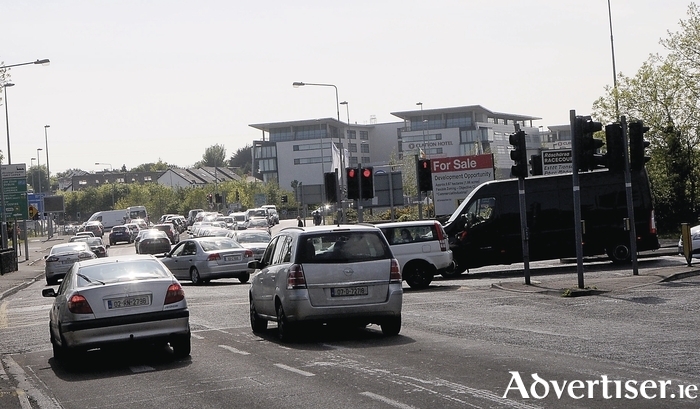 Parkmore's traffic problems today are the result of poor planning policies. Tinkering now with roads widening solutions and creating new turning lanes to solve access problems is like darning an old woollen sock. You know they will do for now, but are soon going to need replacing! Ian Lumley, An Taisce's advocacy officer tells us: “The car instead of being a conveyance of convenience has become our master, dictating spatial mobility and land use patterns. It generates massive negative impacts in resource consumption and emissions as well as unhealthy lifestyles and obesity, with all their social costs. It has moulded the Irish collective psyche, with the main evening current affairs radio programme called Drivetime. Morning and evening radio is interspersed with announcements by the motor industry Automobile Association, which has a financial interest in increasing the number of private car owners on its books, and of promoting road building." At least Conor Faughnan, the AA’s media voice, had the good sense to recommend ‘Galway would be better building a city-wide light rail network, to help resolve its disastrous traffic problems. Insider remembers the 1999 Land Use & Transport Study which laid out present day schemes for the construction of more roads, motorways and public transport (the infamous N6 Bypass and Ardaun emerged from this report ). The study largely ignored rail based options. Buchanan also determined where most new housing would be concentrated, in the satellite towns and villages around the city. The consequent increase in so many disconnected roadfront 'one-off' houses outside of town and village speed limits, unrelated to any site or land based need, turned the countryside into a scattered suburban sprawl, rendering rural roads unattractive for walking and cycling. So, where are the answers to come from? Insider has always been supportive of a radical solution, in the form of ‘Light Rail Transit’. Hundreds of European towns and cities already had from Victorian times adopted rail based transport. Most have already, or are today being updated with new energy efficient electric trams and metros. More than 30 examples of cities/towns similar in population to Galway are using mostly roads based light rail systems. In a strange act of prescience unusual in Galway local authority circles, Galway city and county councils agreed to buy the former Carnmore airport from its owner, Galway Chamber of Commerce. They had no idea what to do with it only the faintest possibility of using it, for film production studios or another business park. These lands should be used as a park and ride site, for cars filtering off the M6 with commuters transferring onto light rail trams out of the depot which could be based there, routing them in through nearby Parkmore East, across through Parkmore West into Ballybrit/Ballybane on in through towards Ceannt Station. A western link could feed in from Cappagh/Barna via Westside through UCHG’s grounds out onto University Road then into town servicing commuters living west of the city. Various alternative route options could also be developed. Insider sees no future in the long awaited €600m + N6 ring road, which he believes again is doomed to fail! With almost €20m having been wasted in years of historic hopelessness, it is time to realise that the recently opened M18/M17 is in effect Galway's outer city bypass. Galway city should be leading the way, after Dublin with its Luas, and be ahead of Cork and Limerick, in promoting regional growth, based on radical citywide regeneration using people friendly light rail public transport, providing environmentally sustainable connectivity. A project team must be put together to plan for a radical new light rail transit. Just as Catherine Connolly TD, has been advising us to do for most of the past 20 years. One day the penny will drop for all other public representatives.